(AFP) - Fierce storms which swept across northern India have killed at least 47, taking the death toll from freak weather over the past month to several hundred, officials said Tuesday. The storms and lightning strikes toppled walls and power pylons or electrocuted victims, as temperatures in India rose as high as 48.6 Celsius (119.5 Fahrenheit). 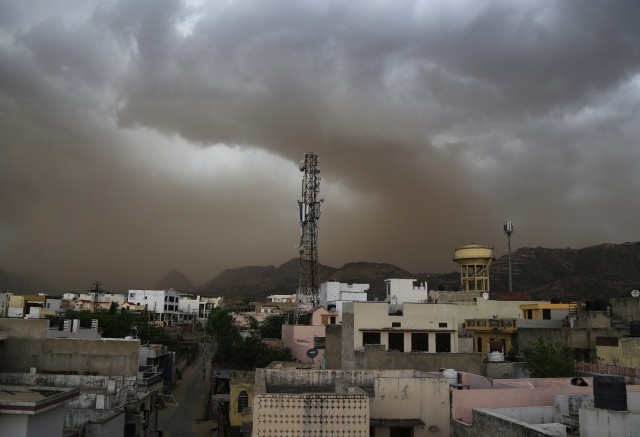 Disaster management officials in the states of Uttar Pradesh, Bihar and Jharkhand said 47 people had died in night-time storms that swept across the region. Bihar was the worst hit, pounded by strong winds and thunderbolts. "At least 19 people have been confirmed dead. 11 of them due to lightning," Yoginder Singh, a Bihar state disaster management official, told AFP. The wild weather extended into neighbouring Uttar Pradesh, where winds of up to 70 kilometres (43 miles) an hour buffeted India's most populous state. "Fifteen people were killed by overnight lightning and high-speed winds," said T.P. Gupta of the Uttar Pradesh disaster management department. Another 10 people were injured, some with burns after being struck by lightning, he added. Many people in rural India sleep outdoors in summer to escape the searing heat, making them more vulnerable to storms. Nearly 200 people have died in Uttar Pradesh this month in powerful sandstorms. Scores have died in other states. In Jharkhand east of Bihar, 13 people died and six were injured in violent weather overnight, said Sushil Kumar, the head of the state's disaster management department. The Indian Meteorological Department has warned that more storms and heavy rain could hit Uttar Pradesh and Bihar in the next two days. Extreme heat has also gripped many parts of India, with a high of 48.6 degree Celsius recorded Monday in Khajuraho in the central state of Madhya Pradesh. In Delhi and much of northern India, daytime temperatures have been above 40 Celsius for the the past week. Weather experts said there would be some respite this week after the annual monsoon season began in the southern state of Kerala on Tuesday. The monsoon will gradually move north. Storms are customary during the summer months but the intensity and death toll has been higher than normal this year.